You must have noticed that it has been a long time since we gave an update on the ice stupas of this winter. Well there was a reason. Our pipeline of 2.3 Km got blocked and we have been constantly working on clearing this for more than six weeks but without success. Each week we were thinking that we will give an update once we have the good news… but this went on for too long. 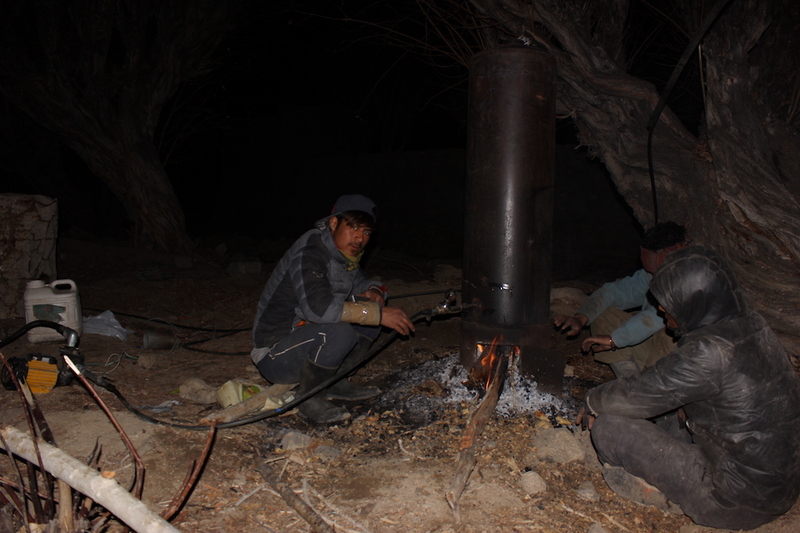 For many weeks our team was taking turns all day and all night to run hot water or steam through the frozen underground pipeline. And finally last night was very special when the line got cleared and the water started reaching the site as it should have throughout the winter. So now we have extended the height of the ice stupa today itself to raise it to 45 feet, from a dismal 25 feet that we could so far reach as compared to last year’s 64 feet. I will tell you the sad story of why the pipeline got blocked this winter in my next post but in this post let me celebrate with the story of how even this misfortune became a great opportunity for us. When the pipes got blocked and weeks of work was yielding no results, we parallely started experimenting with other ideas of expanding the scope of ice stupas and ridding it of the problems faced by the current one. For the last four weeks we started building a new type of Ice Stupa that we now call the run-off-the-river (ROTR) type, that are built on the stream bed itself and therefore uses very short pipe length and are thus much cheaper. So these stupas are made right on the bank of the stream rather than diverting the water to a desert through kilometers long pipeline. While the model with diverted pipelines are important for taking water for greening new deserts as in the case of our original ice stupa (with 5,000 new trees), this new model is good for increasing the water flow in the stream bed itself in the lean months of April and May when existing village farms face acute shortage of water. This was always one of our objectives but the problem with the pipe blockage forced us to work on this new design sooner than we had thought. The tests so far have been very encouraging and promising although they were started late in the winter. The beauty of the project is that the new type is very low cost as it uses only a hundred feets of feeding pipe for each stupa. It also does not need burying or insulation of pipes as we can use low cost flexible rubber or canvas pipes… like the ones used by fire fighters. What worked best was the very cheap plastic hose pipes with a large diameter of 8 inches… Due to the sheer size of the pipe we observed that the pipeline never froze even if left exposed to the night cold of – 15C to 20 C. Icing around the edges did happen but even if a 2 inch ice layer is formed all around there would still be 4 inch space for the water to keep flowing until morning, when all the ice would melt in sunlight. 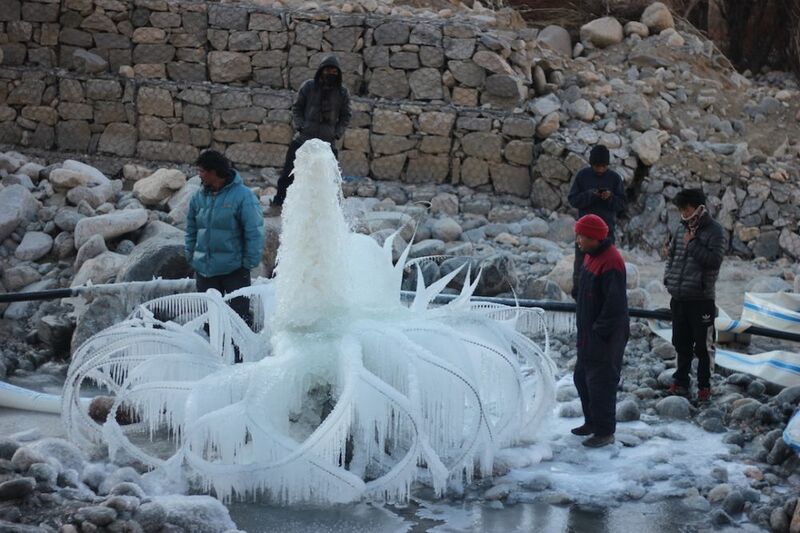 We built five such run-off-the-river type of ice stupas at different altitudes. Two at 11,800 ft one at 13,000 ft, two at 13,800 ft and on Friday the 4th of March our whole team is going on an expedition high up in the Phyang valley to make two such ice stupas at 15,500 altitude. There is also a National Geographic Team that will accompany us to film the whole process. So please wish us luck and a colder spring this year (though it very much looks like the opposite is happening) … as we have only few more weeks to work ☹. 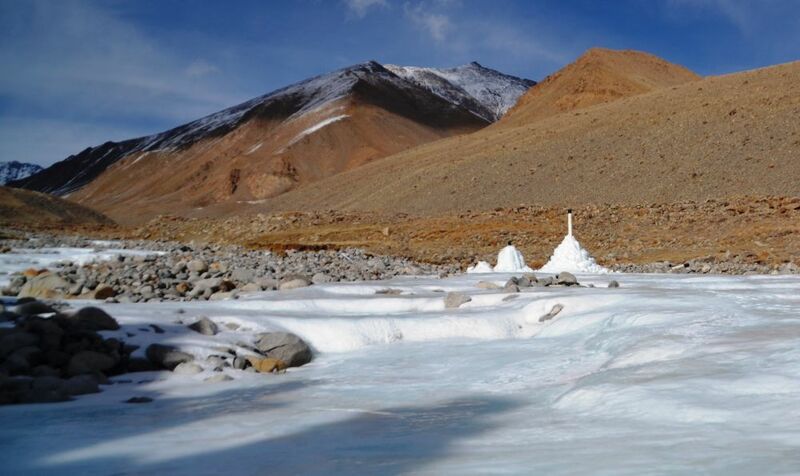 Join Ladakh as it gears up to fight climate change and melting glaciers.